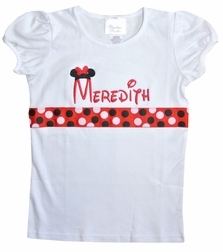 Here we take a white cotton shirt and monogram it with your little girl's name in red Disney font. 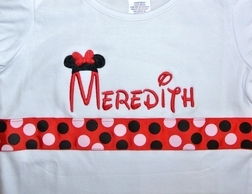 On top of the first letter, we embroider a Minnie Mouse ears hat. 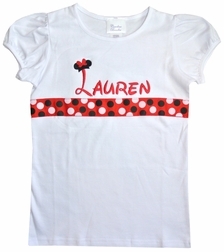 Under the monogram we can embellish the shirt with red with black and white dots ribbon if you choose that option. 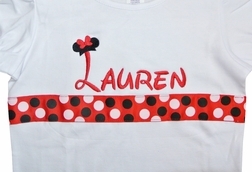 Matches sister's Minnie dots outfit and brother's Mickey Mouse ears shirt.